Male Barrow's Goldeneye, calling, Wrangell - St. Elias National Park, Alaska. Male Barrow’s Goldeneye, calling, Wrangell – St. Elias National Park, Alaska. Guess who should be back tomorrow? Here’s a hint: you might get to see something besides birds on here real soon. Of course I’m writing this post 2 weeks in advance, so there’s a chance you might not, too. But by the time this goes online, I should be just about back from 2 weeks in ……? 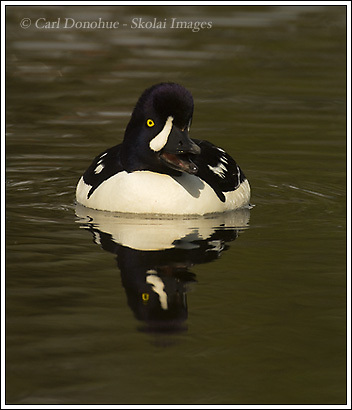 So here’s the male of the Barrow’s Goldeneye again. I liked this image because his bill is wide open and he’s looking at me. I had just moved slightly, where I was more visible to him, and it was as if the bird was saying ‘dude, I so TOTALLY see you’. This was one of the last images I made of this duck. What a cool bird. Male Barrow’s Goldeneye, Wrangell – St. Elias National Park, Alaska. This entry was posted in Alaska, Birds, Wrangell - St. Elias National Park on June 21, 2008 by Carl D.
Those birds are so beautiful , I don’t think anyone could get tired of looking at them. He does look like he’s telling you something. I always wonder how animals see us! I bet they think we are weird looking creatures! I can’t say how they might see us, but I would hazard a guess it’s in a very different light to how we might imagine them to see us. Did you ever hear about the gorilla or chimp that essentially learned a good portion of the human language, enough to communicate effectively with his handler? One time they asked the ape ‘what do you apes think of humans?” and the reply was “we think you are stinky toilets”. Says it all, I suppose.